Meet Theresa (aka @theresa_piitlates)! When I saw this collage below, I could not believe my eyes! 140 days of PIIT28 (Pilates Intense Interval Training, only 28 minutes a day) and she’s 40 pounds down from the day she started. That is INCREDIBLE! It’s not easy to motivate yourself to move, especially when you feel heavy, lethargic, and in many cases, sad. It takes a lot more than people can understand to find motivation when you’re starting from a dark place. “Just do it” is a simple phrase but it means nothing if the fire inside you does not want to burn. CASSEY: When you first signed up for PIIT28, what were you expecting? THERESA: Honestly when I first signed up I thought it was going to be like other work out programs I have tried. I thought it was going to be hard and not fun. I thought it would drag out and I wouldn’t be able to do it…I wasn’t confident in myself and I wasn’t sure if I’d be able to put myself through something like this. I wasn’t comfortable in my own skin and even today, sometimes, I am still not. But I’m working on it. I always tell myself to look up, not down. The day I started PIIT28, I committed and said to myself – NO MORE EXCUSES! CASSEY: You totally killed it! I’m so proud of you! :) Do you think you’ve accomplished your “dream body”? THERESA: My dream has always been to lose the heaviness of my body. I’ve carried a lot of weight for a long time. So, have I achieved that? Yes! But am I where I want to be? No, I would like to be a little stronger and a little more toned. But I know I am more than half way there! CASSEY: What excites you most about your transformation? THERESA: To be honest, how I FEEL is what I am most excited about. The look in the mirror was the icing on the cake for me. I feel so much happier, so much more excited to work out, and I feel STRONGER mentally. Cassey has helped me push my negative feelings out the window with every move and it’s such a stress reliever. I now have more energy to do the things I love, and the best part is it’s not all in my head, my husband notices my increase in energy too! 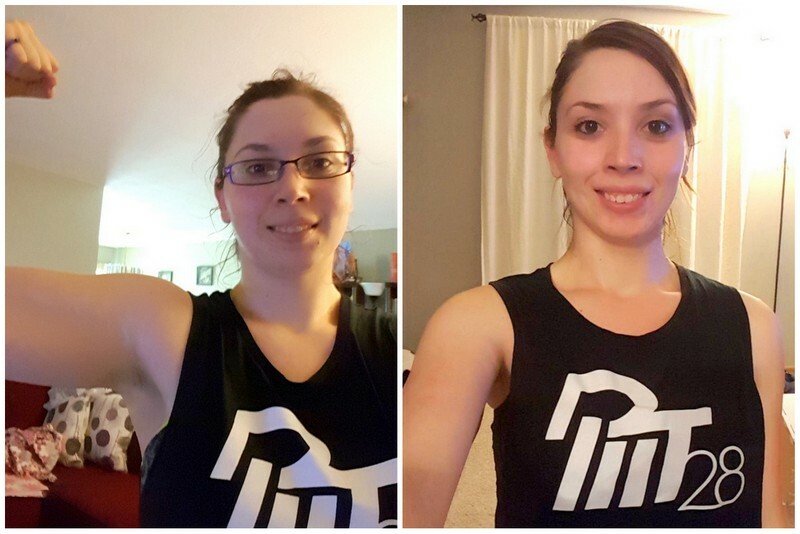 This is Theresa 23 weeks apart in her earned-not-bought PIIT28 tank. She’s like a totally different person! THERESA: I have had anxiety for a long time and it’s something I have always fought to handle without medication. PIIT28 grounds me, it relieves stress and any anxious feelings I may get. I used to get depressed a lot because of my weight and the way I looked. I know first hand how that is…it’s like a spiraling black hole that never ends. But since joining this community, I feel like I’m no longer trapped in side this hole. There’s less tension, less anxiousness. I get to see others in different stages of their journeys, I sympathize with their struggles and then I realize that it’s not just me! It really helps to connect with other people. PIIT28 really made me so much happier and healthier! I finally have a better relationship with my body. CASSEY: What’s your “power phrase” for when you’re about to give up? THERESA: I CAN and WILL do this. I am strong and nothing can tear me down. This is for me. CASSEY: What’s a typical daily meal plan look like for you now? Breakfast: Usually greek yogurt or a egg white wrap with a cup of coffee, no sugar. Lunch: Varies. Sometimes it’s a fruit smoothie or a Lenny and Larry’s complete cookie with some fruit. Dinner: Chicken, tofu, or fish with variety of veggies and a grain like quinoa or brown rice. CASSEY: Advice for POPsters going through PIIT28? THERESA: The biggest thing in my opinion is to remember everyone is on their own journey and we won’t have the same results! I mean, it’s totally ok to get mad, upset, or down but don’t stay negative. Remember to pick yourself back up! It’s going to be hard, but you’ll be stronger, healthier, and happier because of it. Also, never let anyone pull you down or tell you it won’t happen because it will, and they are wrong. And finally, don’t be afraid to reach out to a friend if you’re having a hard time because it’s better to vent than to bottle up your feelings. CASSEY: How would you describe the PIIT28 Community? THERESA: Everyone is so passionate, so open, and always willing to be there for support and to give friendship! I love reading their stories and bonding over similar achievements and hardships. (We all struggle, but we never give up!) Having friends throughout this has also built up my confidence. CASSEY: I feel you glowing through the screen! THERESA: I’m feeling so excited right now and so happy that you asked me to share my journey with everyone! I’m just thrilled!! PIIT28 wasn’t easy, but it was so worth it. Thank you beautiful Theresa for sharing your story! You are SUCH an inspiration to us all. Guys comment below and let us know how you’re doing on your fitness journey, be it PIIT28, the Blogilates Workout Calendar, or whatever you’re doing to stay active! That is really motivating. I am currently at 220lbs, the heaviest I’ve ever been and am feeling discouraged. I’ve completely changed my diet and have been working out, but just recently ran across this on YouTube. It seems like a great group of motivating people which is what I need. I know if you can do it, so can I. This is amazing! Congrats Theresa! You look good!! A little off subject here…. I have completely fell off the health wagon. I’m making the poorest eating choices, have completely stopped working out, and I feel like [email protected] I have lost my energy, perkiness, and mental sharpness. When my kids went back to school in September I lost all motivation for well, anything. I also coach youth sports teams and it seems like I never have any time to myself or when I do have time for myself I am exhausted. I tried to jump back on the wagon last week with Cassie’s cardio day on the calendar and I was so out of breath and hardly got through the entire routine. I was sore for days afterward and did not want to move let alone workout. I came so far back in June, I followed the calendar day by day, cleaned out my pantries and fridge of any unhealthy food and replaced it with clean nutritious food, even rewarding myself with Cassie’s amazing smoothie recipes post workout. I just can’t find the motivation in me to start back up again and I would hate to go back to the beginner’s calendar after all the hard work I’ve done to graduate to the monthly calendars. I’m almost back where I started in weight before I found blogilates, I both mentally and physically feel the same before I found all you amazing popsters. I feel utterly defeated, mentally bankrupt, and physically depleted. It feels like I’m trying to squeeze blood out of a turnip when digging for energy and motivation. I think I’ve stopped caring. I don’t want this for myself but I can’t force myself to do what needs to be done, I’m so darn stubborn. Any words of wisdom or advice would be appreciated. First of all, doesn’t working out brings you joy ? I’m just gonna repeat what Cassey usually say, don’t work out because just of your body, but because it makes you feel good, physically and mentally. You need to start finding happiness in working out once more, or you’re just gonna torture yourself. Secondly, don’t blame yourself for not having motivation anymore. We all have are dark and difficult moments, they can even last for months, but it’s never forever and it’s not your fault. It can be a combination of various things, even hormones messing with you ! Try to find motivation in your kids, your students, your friends, if you can’t find it in yourself for the present time. Feed on their energy. Talk to them if you have to, it can help. But most of all, start caring about yourself a little bit more. It’s seems silly to say but it still needs to be said. You’re a wonderful, amazing human being that deserves attention, starting from yourself. Don’t give up on yourself. You’re worth it. On a word of advice, try to meditate, if only 5 minutes a day. Sit on your bed, close your eyes, concentrate on your breathing and try not to think. If a thought comes, just let it pass and don’t attach yourself to it. It will help you reconnect with yourself and start caring about yourself once more. I know it can be strange to receive life advices from an 18 years old, but we’ve all been there, you’re not alone in this. If you need to talk, let me know. Thank you Apolline. You are extremely wise beyond your years. I’d take that advise from a 5 yr. Old because it’s great advise. Thanks again. Wow, that’s so kind of you to say, thank you so much ! Congrats Theresa. I know that took a lot of hard work and determination. Wow! Congrats on your weight loss!! Amazing job, Theresa! Such an inspiration. I so want to do the PIIT28 program as I seem to have so little time lately (28 minutes is perfect! ), however the thing that has stopped me from pulling the trigger is that I have bad knees and I can’t do to the burpees and other jarring jumping moves that are in some of the workouts. Are the PIIT28 workouts low or high impact? This transformation and story is so inspiring! I already bought the program and I found that it was hard on my knees too. That is why I am starting with the monthly calendar workout and once I build up my strength I plan on moving to PIIT28!!! Best part is that the monthly calendar and videos are free! I feel your glow through the screen too, Theresa! What a wonderful transformation. PIIT28 is full of videos plus an ebook! So I think you’ll be just fine! Congratulations ♥ You are such an inspiration and a real powerhouse! Especially happy for you continuing on a path of growth and light while living with anxiety and depression. Sending lots of love your way! Was the after picture at the start or end of round 5? Waouw thank you so much for this message ! This is very motivating and so nice of you !! I’m going to take a look at the video you mentioned and I’m really motivated to get started now !!!! I started my blogilates journey and I’m now at day 6 of the Beginners calendar, I’m so proud of me :D Your message was really motivating !! Good job Theresa! You look incredible, but the fact that you FEEL incredible is ever better! Wow…so proud of you!!! You are beautiful….